Bose as a brand has received a lot of flack from audiophiles but there is no denying that they make some great audio products. The QC series is a noise canceling force to reckon with and the Soundlink is a great portable speaker. Today we have with us the premium soundbar from Bose, the Bose Soundbar 700. Overall, the quality of sound output is what you’d expect from a premium soundbar and it brings with it some unique functions too. However, there are features the soundbar lacks which at this price point is a bummer. In the box, you get the soundbar itself along with a remote control that can double up as a universal remote control. You also get four AAA batteries, a cleaning cloth, ADAPTiQ headset, optical cable, HDMI cable and of course, the power cable. Considering this is a premium product, it is nice to see the optical and HDMI cable bundled in the box. The cleaning cloth is a boon and we will highlight why in the design section. The remote control accompanying the system is extremely interesting and we will touch upon that in the review as well. 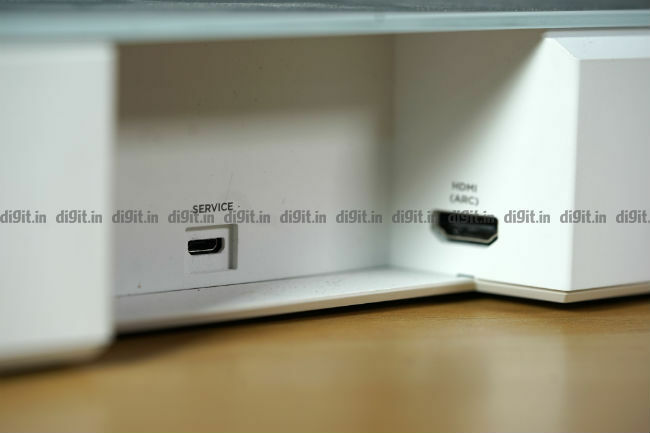 When it comes to connectivity options, the soundbar has an HDMI port for ARC connectivity, but sadly there is no HDMI pass-through option which is disappointing at this price point. There are a lot of soundbars offering this feature and some like the JBL SB450 (read our review here) even offer 4K HDR passthrough making it the HDMI hub under your TV. Moving on, the Bose Soundbar 700 also has an Optical input, USB input CEC, and of course a port for the ADAPTiQ headset. You can connect your smartphone to the system via Bluetooth if you like. The soundbar also supports Alexa voice controls so you don’t need to find your smartphone or remote control if you want to change the track or increase/decrease the volume. The more time you invest in setting up the soundbar, the better the experience will be. Why you ask? Well, to get the best output from the soundbar, you will spend some time calibrating it to your listening positions which is a very good thing. After you connect it to your TV via ARC or an optical cable, you will be prompted to download the Bose Music app. Once the app is downloaded, you can follow the onscreen instructions which is pressing next a lot and signing into or creating a Bose account. During the setup, you will be asked to connect the ADAPTiQ headset and sit in 5 places in your room where you are most likely to sit and watch TV. This calibrates the soundbar to give you the best possible listening experience for the position you are sitting at. I highly recommend going through this setup carefully as instructed. It does influence the listening experience. Once you’ve followed the instructions on the app you can go on to calibrate the remote control included with the soundbar as a universal remote control. 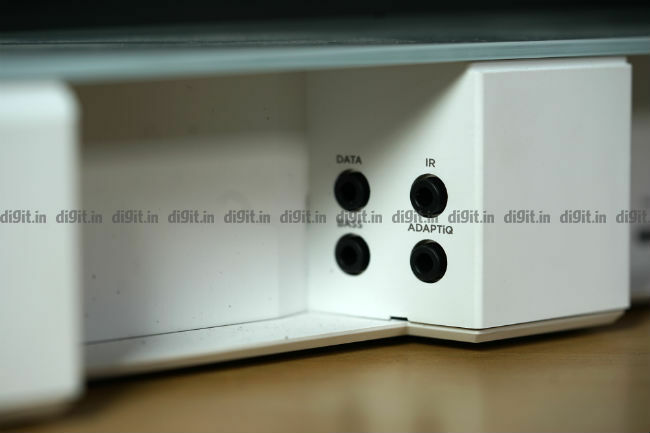 This will enable you to switch on/off your TV, set-top-box and even your gaming console. Overall, setting up the soundbar takes some time, especially when it comes to your listening position, but it is worth the effort. Speaking of the design of the soundbar, it is available in two colours - black and white. The top of the soundbar is tempered glass and despite looking extremely elegant, is prone to gathering dust easily. 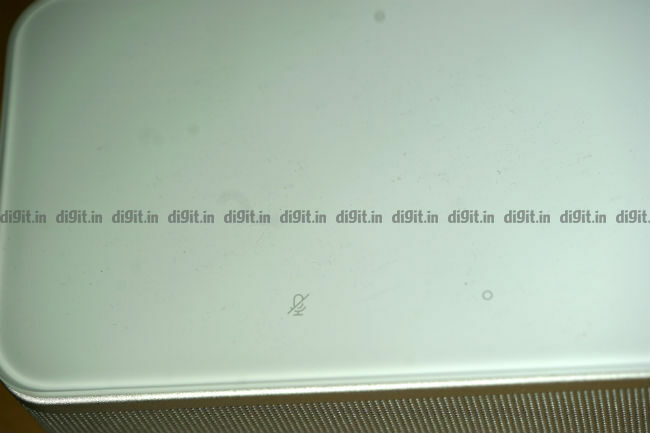 This is why Bose has included a microfiber cleaning cloth in the box. You will spend some time cleaning the soundbar. The soundbar is also really long measuring a little under 40-inches. It is ideal for a 50 or 55-inch TV and may seem overwhelming under a smaller TV. All the connectivity options are hidden at the back which is nice. The top houses two touch sensitive buttons - one to mute the microphone and the other an action button. Below the buttons, on the front panel of the soundbar rests a small thin white light which illuminates when you give the Alexa command or interact with the remote. At times, the pulsating light looks like something out of a sci-fi movie. The drivers themselves have a wraparound metal grille giving the soundbar an elegant look and premium feel. 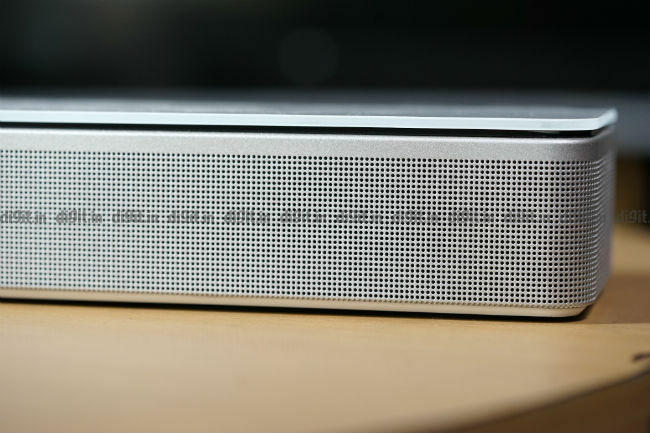 The grill curves on the edges and wraps itself very neatly around the soundbar. You have the option to wall mount the soundbar or place it on a table top stand. Overall, the design of the soundbar 700 is elegant and it is extremely well built. Considering the Bose Soundbar 700 is a premium product, you expect premium performance and that’s what it delivers. One thing to note is that Bose does not list the driver specifications on its website, so we don’t know the tweeter, woofer specs in it. Even though the soundbar is one that sits under your TV, it is one that has pretty good surround effects and channel shift, something we will highlight below. It is also clear even at full volume. The only downside to the performance is the absence of Dolby Atmos and DTSX which are features you'd expect in a premium product. Watch movies and you will realize that the soundbar is meant to give you a surround experience. From the bike chase sequence in Mission Impossible: Rogue Nation to guns firing all over the place in the Matrix and even in movies like A Quiet Place where after a quiet moment you have sound of the creatures all around you, the channel shift and surround effects are incredible considering this is a soundbar. If the sound needs to come from your left or right it does feel so. You know that it is being simulated by the sound bouncing off walls, but considering the effect is coming from one bar under your TV and not surround speakers is impressive. Dialogues are very clear too even in the heat of battler in a movie like John Wick. A musical like La La land will engross you and make you emotional with the audio alone. The Music performance of the Bose soundbar is what you’d expect from a Bose speaker. It is also dependent on the kind of music you listen to. So with classic rock, where the base isn’t necessarily overpowering, it sounds clean. Vocals are distinguishable from the instruments and highs are clear. When it comes to Daft Punk’s electronics music you can make out the different tunes of the synthesizer at play. If you like heavy metal however, then you will feel the lack of a sub for the lows. If it is classical where the vocals take centre stage, the speaker can produce them quite clearly. The speaker doesn't distort at loud volumes and even though we played music at full volume for some time, you wont need to go beyond the 70 percent volume mark in the average living room. 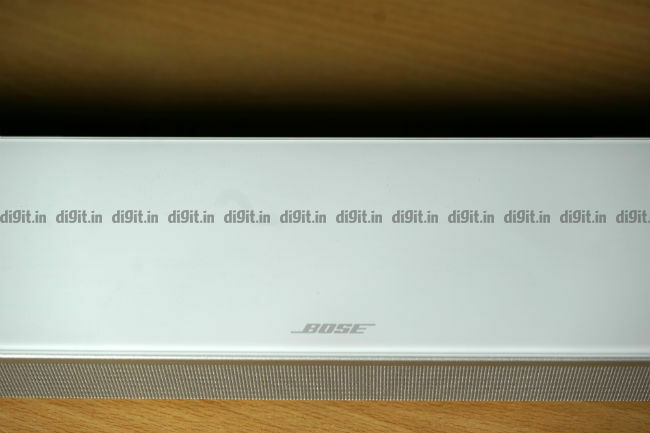 Audiophiles may have their preferences when it comes to audio equipment for music but considering the sound bars we've tested at Digit, the Bose Soundbar 700 is definitely one good allrounder when it comes to movies and music performance. Overall, if you are looking for a soundbar, it is every bit as impressive as you’d expect from Bose. If you are missing the extra umph, you can consider buying the optional subwoofer. Heck, for a more immersive surround experience you can even consider the optional surround satellite speakers, but if you just want the bar alone, it will perform quite well. As awesome as the sound output is from the speaker is, the performance of Alexa is just as buggy. It will recognize the voice commands 70 percent of the time. Using an second gen Echo Plus on a daily basis, I know Alexa’s recognition rate is a lot higher than 70 percent. The sound bar recognized some commands and for some it did what it prefered. For example when I tell my Echo Plus that its my birthday, it starts singing happy birthday. Say the same to the Bose Soundbar 700 and Alexa says she doesn't understand the question. I thought this could be an internet issue but the network was working fine throughout the house during the test. 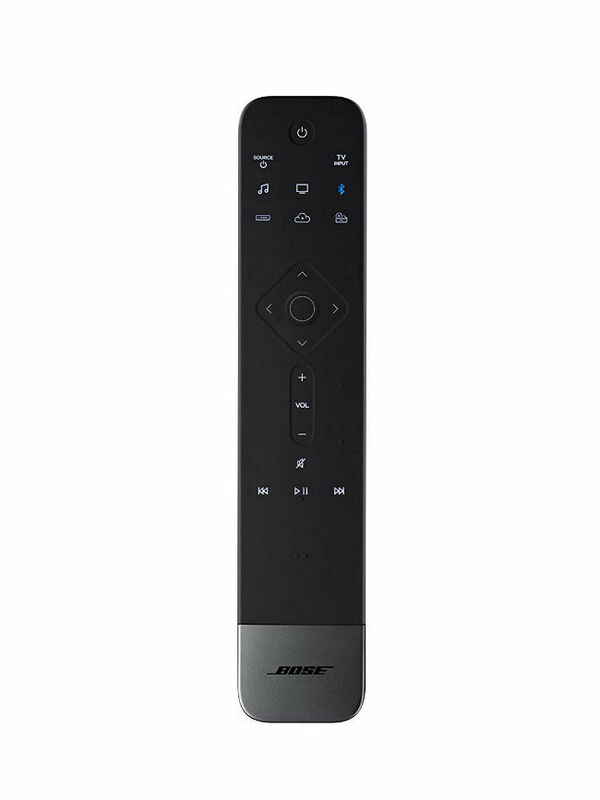 The bundled remote control with the soundbar is both traditional and futuristic. Traditional in the sense that it has all the possible buttons imaginable on it and it runs on 4 AA batteries. Futuristic because the buttons aren't clicky like a traditional remote control. And here is the best part, only that portion of the remote lights up based on the feature you are using. So if you are listening to music, the number pad and other TV related controls are deactivated. When using it as a remote for your TV, all the appropriate functions are lit. This is a convenient feature as it prevents accidental presses of the wrong button. The remote control can give something like the Logitech Harmony a run for its money, if only it worked every time. There are times when I wanted to switch on my TV and the soundbar with it and only the soundbar came on and vice versa. Also, I failed multiple times to sync my PS4 Pro to the universal remote. Even though the process of syncing your gadgets is as simple as navigating the app, it can take some time and can get a little frustrating. So here’s answering the most important question, should you buy this soundbar? For comparison, it’s hard for us to tell you alternatives to consider as we haven’t tested quite a few of them. However, think of it this way. You can buy the soundbar today, add a sub later if you miss the ground shaking thump and if you want to venture into home theatre territory, you can add the surround speakers later. It is this modular nature of the soundbar coupled with great audio performance that makes it attractive. 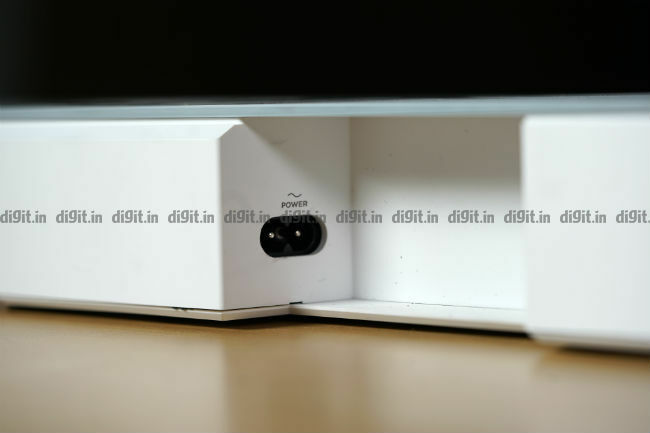 However, remember that the base module for the Soundbar 700 costs a whopping Rs 64500 and the satellite speakers cost 28240 for a pair. This brings the cost of the entire setup, including the soundbar to Rs 1,71,740. You could get a kickass home theatre from the get-go if that's your budget. Coming back to the soundbar 700, on the downside, it is missing out on current gen tech like Dolby Atmos and DTSX and some of the smart and universal functions are buggy. It also does not have HDMI passthrough. If all these features are important to you, then you may want to consider your options. If you are looking for a premium soundbar with good sound output, then you can consider the Boss soundbar 700. If you are considering the Bose Soundbar 500 which is about Rs 20,000 cheaper, then hold your horses. We will review that one really soon.